One of my favorite restaurants in the city is Landmarc at the Time Warner Center. It's one of those casual elegant restaurants that's just as welcoming to tourists in jeans or flip-flops as it is the power-lunch crowd. With an expansive dining room that takes up an entire side of the building, there is rarely a wait, which means it's great for spur-of-the-moment meals and they always accompany the check with a handful of homemade salted caramels. I've been there for dinner many times with Eugene (including this remarkable evening), have had brunch there with my family and friends, and when I was working at Hearst and my office was just a couple blocks away, I would always schedule lunch meetings there. The fact that my train station is located directly beneath it doesn't hurt either! One of my favorite dishes to order at Landmarc is their Thursday pasta special--orecchiette all norcina, which I was introduced to by my lovely friend Aryanna, who once tasted it at an event and then raved about it for days until we finally escaped for a mid-day feast to see what all the fuss was about. This creamy comfort dish originated in the Italian village of Norcia, located in the southeastern part of the Umbrian region of Italy. Norcia is legendary for its black truffles, pork, and wild boar products, particularly sausage, and to this day pork products in Italy are referred to as "norcineria." The sauce reflects these regional flavors with tiny bite-size pieces of sausage and pasta in a rich cream and mushroom sauce. It's the sort of dish that's perfect for a rainy evening, or even for lunch on one of those days when you need a little something extra to get you through the rest of the day. It's been months since I've actually been to the restaurant to order it, but while poking around in my fridge the other day, I realized I had everything I needed to create a similar dish. Note that this isn't meant to be an exact copy of that dish, but it's definitely pretty close. Even better because it takes only minutes to whip up and ends up costing just a few dollars per serving. I added one major twist to my version--cremini mushrooms. The version I tried at Landmarc doesn't have mushrooms, but I had a package in my fridge and knew they would pair nicely with the other ingredients. As the Umbrian region is also known for its truffles and mushrooms, I didn't think the additional earthy flavors would be out of place. I chopped them up coursely and absolutely loved how they seemed to melt right into the dish, adding bulk and nutrition (one cup of cremini mushrooms provides up to 18 different vitamins, minerals, and antioxidant phyto-nutrients). I infused the sauce with fresh rosemary and nutmeg, and added red chili flakes for heat--all of which gave the rich cream sauce a layer of depth that kept me going back for more. 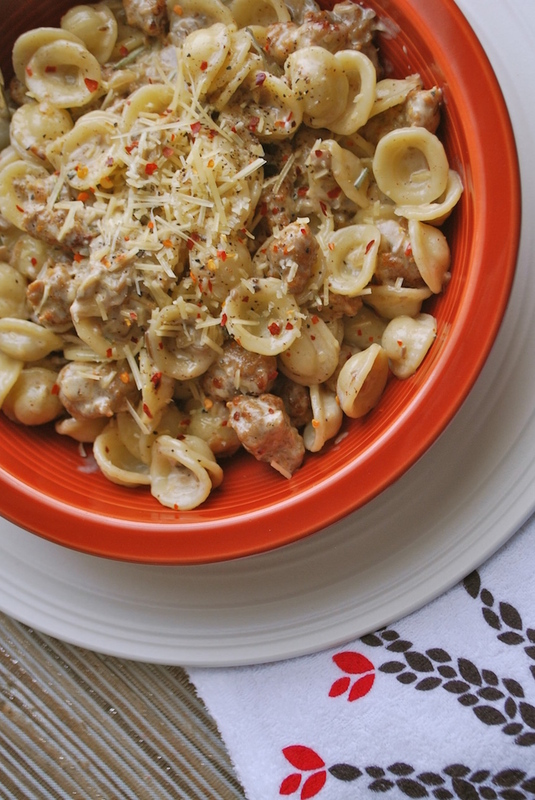 I use orecchiette in this dish as inspired by the restaurant version, and I love the way each of the little bowls (orecchiette actually means "little ears" in Italian) scoop up the sauce for a perfect bite every time. If you prefer, you can of course substitute any kind of pasta you'd like. P.S. The pretty cloth to the left of the bowl with the brown and red tree came from an incredible new company called Janum that I'll be sharing more about soon. The blue-striped cloth on the right is my sock...on my foot, which is bracing me while I snap the photo from above. Bring a large pot of water to a boil. Salt and add pasta. Cook until al dente (about 10 minutes). Drain, reserving 1 cup of the pasta water. While the pasta cooks, remove the sausage from casings and break up into small pieces. Heat 2 tablespoons oil in a heavy pan over medium heat and add the sausage. Cook for 2 minutes until lightly browned. Add the onions and garlic cloves, saute together for 3 minutes until fragrant and soft (you don't want to caramelized the onions). Add the chopped mushrooms and cook for 5 minutes or until cooked down and any liquid has reduced. Add the cream, rosemary, nutmeg, and red pepper. Let the sauce cook for 3 to 5 minutes, stirring constantly. Add the cooked pasta and the cheese and toss to coat evenly. If sauce is too thick, add some of the reserved pasta water. Season with Kosher salt and black pepper, to taste. Serve immediately.